On October 10, the Yankees fired Kevin Long, basically scape-goating him and ending his eight year term as their hitting coach. While Long long ago found further employment in another borough of New York City, the Yankees haven’t even seemed to make any progress in their search for a new offensive guru. Luckily, I’m here to solve this problem. The Yankees should hire Marcus Thames. Look. The Yankees’ hitting coach search has been a bit ugly so far, as they have been spurned by coaches from all walks of life and experience levels. Former Yankee Chilli Davis signed with the Red Sox, when they gave him an extra year on his contract to keep him from going to the Bronx (the rivalry lives!). Eric Hinske, who has never been a lead hitting coach, decided to stay on the Cubs’ coaching staff. Dave Magadan decided to stay in Texas. Even Raúl Ibañez, a Yankee hero from 2012 who literally just retired, decided he didn’t want the gig, and might actually be hired by the Rays to manage the whole team, which might be insane, but might work. This brings me, finally, to Marcus Thames. The Yankees have already interviewed the 37 year old Thames, along with James Rowson, the minor league hitting coordinator for the team. Yankees fans should be very familiar with Thames. He was drafted by the Yankees in the 30th (30th!) round of the 1996 MLB Amateur Draft, and made a very memorable debut on June 10, 2002. The first pitch he ever saw in the big leagues was a Randy Johnson fastball. Rather than crap his pants like any rookie might, Thames turned it around and crushed it over the fence for his first big league hit, home run and RBI. He wouldn’t hit another homer in pinstripes for eight years, because the Yankees traded him to the Rangers that offseason for Ruben Sierra. After a year in Texas, Thames spent the next six seasons in Detroit before the Yankees brought him back for the 2010 season. He was pretty solid for them, hitting .288/.350/.491 with 12 homers while serving as a platoon outfielder against lefties. After the year, the Yankees let him go, and he finished his career with a mediocre season in Los Angeles. 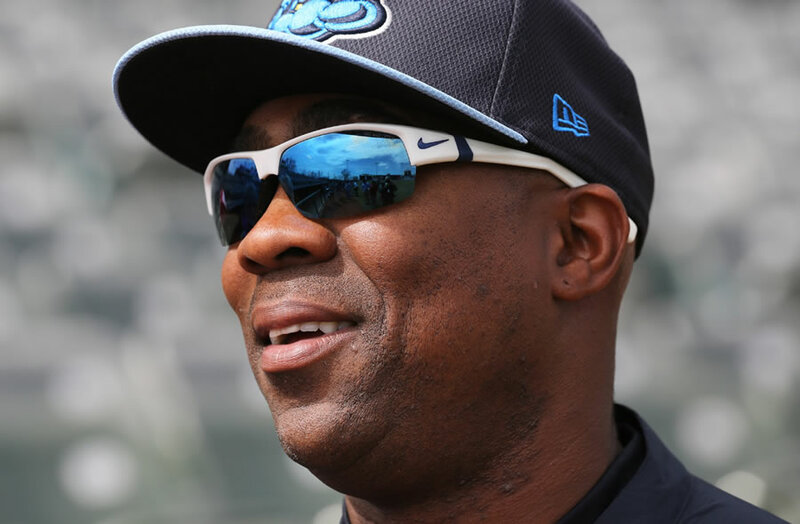 The Yankees almost immediately brought him back into the folds of the organization, hiring him as the hitting coach for the Class A Advanced Tampa Yankees in 2013. After proving himself worthy that season, Thames was “called up” and named the hitting coach of the AA Trenton Thunder. By all accounts, as evidenced by his promotion to AA, and the fact that he’s been interviewed for the big league job, Thames has done a great job of molding some of the Yankees youth. Will Thames be able to capture the trust of older major leaguers like he has the young kids in the Yankees’ minor league system so far? I think he’ll be OK. Kevin Long was just 41 when he was named hitting coach, and had never played an inning in the Major Leagues. He did pay his dues for a lot longer in the minors (about ten years), but he was in a largely similar boat as Thames. Plus, hitters don’t care how old or experienced a hitting coach is, or if they have to sacrifice live chickens, if they see improvement in their swings. Plus, A-Rod and Beltrán will spend most of the year on the DL anyway as their rickety old bodies wither away like dust in the wind (It’s all we are). The Yankees have a couple of choices with Thames. They can sign someone to a two-year deal–which looks like is all they’re willing to commit to–and maybe hope Thames continues his development as a coach in the minors (and doesn’t leave), or they can just take a shot on him with a two-year deal with the big league club and see if he can swim. Frankly, I’m not sure anyone could lead this offense to success as it stands, so why not take a chance on Thames? If he helps this offense improve, that’ll really say something. At the same time, they can start taking a chance on young hitters like Rob Refsnyder and José Pirela and see if Thames helps them develop further too. Come on Yankees. You know you wanna. Hire Marcus Thames already!